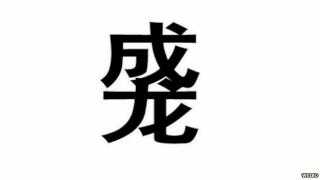 A new Chinese character, "duang," has gone viral. Nobody's sure what it actually means, but Jackie Chan has everything to do with it. According to a BBC report, duang has appeared over eight million times and claimed the most-popular hashtag title on Weibo, China's version of Twitter. But where did it come from, and what does it mean? It all seems to have started with Hong Kong action star Jackie Chan, who in 2004 was featured in a shampoo commercial where he said famously defended his sleek, black hair using the rhythmical-sounding "duang." The word resurfaced again recently after Chan posted it on his Weibo page. Thousands of users then began to flood Chan's Weibo page with comments, coining the word in reference to his infamous shampoo appearance. The word appears to have many different meanings, and there's no perfect translation, but you could use it as an adjective to give emphasis to the word that follows it. A kitten might be "duang cute," for example. Or you might be "very duang confused" by this blog. For readers of Chinese characters, the Jackie Chan theme is also apparent from the quirky way in which the word is written: a combination of Chan's Mandarin names. On the viral scale of coolness, we're inclined to think fresh slang invented by the Drunken Master > weirdly-colored dresses. You win this round, China.